Prepping for survival means you have the items needed to survive and even thrive no matter what might happen. It could be a natural disaster, economic collapse, or any other number of possible scenarios when the SHTF. Preppers and survivalists know what it takes to survive, and they have the knowledge, along with plenty of items, to make sure they can weather anything that happens. Of course, when you start to look at the items you need, you quickly discover that you need to have a small fortune to get everything that you want! However, the problem with that statement is that you are looking for everything you want, and not necessarily just the items you need. This is a common problem with preppers. They end up spending too much on items that they may never actually need. Another issue is that many people simply do not know how to budget. They buy their luxury items now, and they never stop to think that they could be using that money for the goods they need. Here are some tips that can help you. The first thing you want to do is to set up a budget for prepping. This budget should be extra money that you have. You never want to skip the rent or mortgage just to get the prepping items you feel you need. If you want to increase your budget for prepping, consider cutting out some of those luxuries to save some money. For example, you do not really need to go out for lunch all the time, and you do not need to stop for coffee every morning. Just cutting out those things can give many people a hundred dollars or more each month that they can put into prepping. Make a list of the items that you need to have, and then have a list of the items that you want to have. This will allow you to focus on the things that are the most important for your survival. In addition, you should always keep an eye out for sales. Saving 10% or 15% on the items you need, whether it is ammunition, rice, or anything else is helpful, especially when you look at the big picture. When it comes to food, try to buy in bulk, as this will be a much cheaper option. Also, learn to do certain things for yourself, so you do not need to buy all those fancy gadgets and items that you might think you need. If you know how to read a compass and you have a map, do you really need to have GPS when you are out in the middle of nowhere trying to survive? Our ancestors could get by with a compass, and even the stars, so you do not need to have satellites guiding your every step. You will find that you can learn to do many things without all those gadgets. One of the best things you can do while you are prepping is to keep adding to your pool of knowledge and learn new things. Thanks to the Internet, you can often find free or affordable ways to learn different skills. 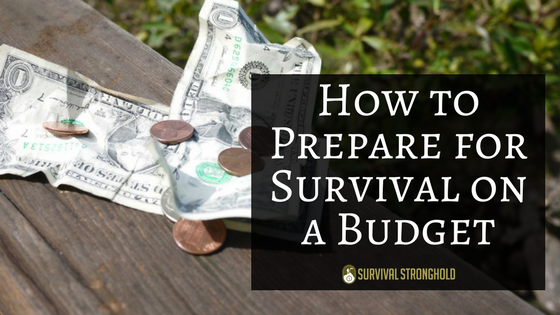 Budget and buy smart, and you can get the prepping items that you need for survival.